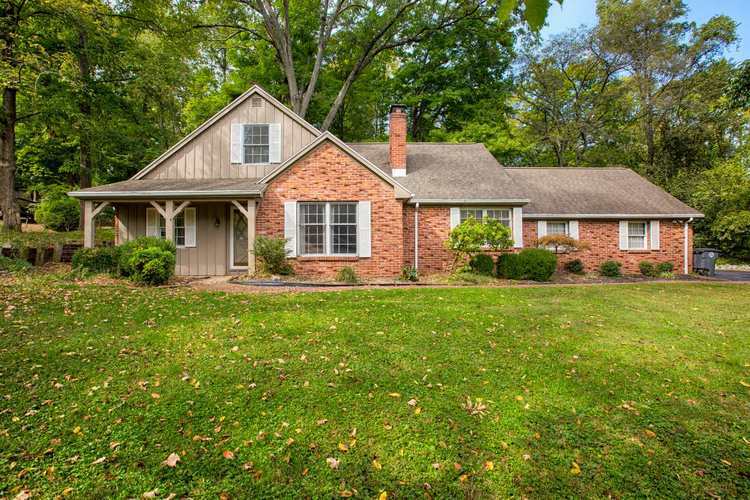 Check out this beautifully landscaped 3 bedroom, 2 bathroom cottage-style home nestled quietly amongst the mature shade trees on a half acre lot in a desirable subdivision near Evansville Country Club, schools, restaurants, shopping, and much more. The vaulted ceiling in the living room gives the home a spacious feel the moment you walk in the front door, and the exposed beams and hardwood flooring in the family room are the perfect compliment to the two sided fireplace. The updated kitchen features a breakfast bar, stainless steel appliances, and beautiful counter tops and backsplash. The dining room is just off the kitchen with French Doors leading outside to a relaxing outdoor patio space, perfect for grilling and entertaining friends and family. The completely remodeled main floor bath features a whirlpool tub. The master suite features hardwood flooring and has a private remodeled bathroom with walk-in closet. Beautiful lighting and modern neutral paint colors throughout the home give the home a truly cozy and relaxing feel. Sellers are offering a 1 year HSA home warranty for the buyer's peace of mind. Directions:From Stringtown Rd., head East on Hesmer Rd. Turn right and head south on Weaver Rd., Turn right heading West on Stonegate Rd. to Wood Castle Rd.